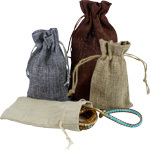 Burlap and Linen style bags with drawstrings. Sold per package of 12. 2A656218 - Natural Burlap Bag - 4"x6"
2A656222 - Grey Burlap Bag - 4"x6"
2A656220 - Brown Burlap Bag - 4"x6"
2A656226 - Natural Linen Bag - 4"x6"